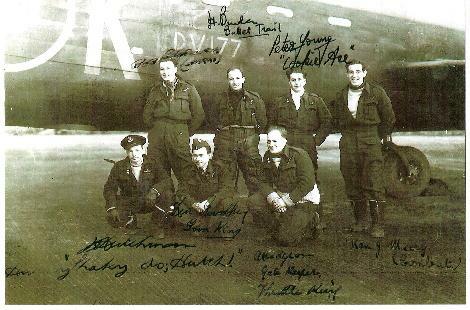 On the night of the 23rd May 1943, some three months after his 22nd birthday, Wally and the rest of the crew set off on the first operation of their tour of duty, bound for Dortmund. Not only was this their maiden flight, but it was also that of their aircraft a Lancaster Bomber ED995. ED995 had only been delivered to Wickenby some four days earlier. Unbelievably Wally went on to complete the whole tour of 30 operations in this one plane! The crew who had only come together as the seven last men standing when everybody else had ‘crewed up’ through self selection based on known experience or friendship. So seven men, unknown to each other, all from different walks of life and from different parts of the UK, set off on a flight of just short of 6 hours, totally unaware that through trust, courage, teamwork and a large slice of luck six of them would survive the first tour of some 5 months and 200 flying hours ahead. The only original crew member not to survive was Wireless Operator Sgt. T A Routledge, who died of oxygen starvation on the second operation, a night raid on Dusseldorf.He was only 29 years old! He is is buried in Pershore Cemetery Worcestershire. 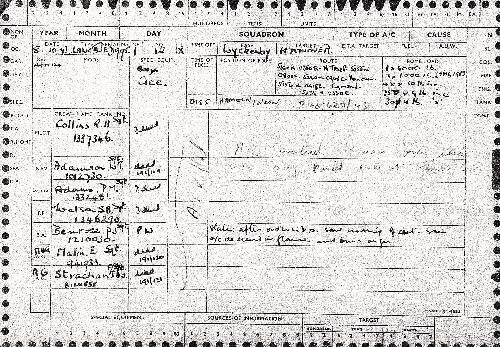 12/X F/O F.J. Wright - On return it was found that the Wireless Operator F/S T.A. Routledge 1178835 had died of anoxia, caused by failing to plug into the oxygen supply, and had been without oxygen for around 52 minutes at 25,000 feet. 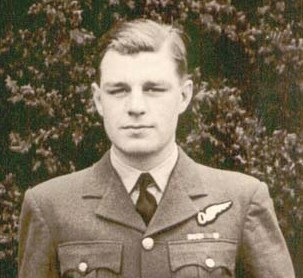 Sgt D T Hone was replaced By Sgt R Edgeworth for the last 3 ops of the crew's tour. 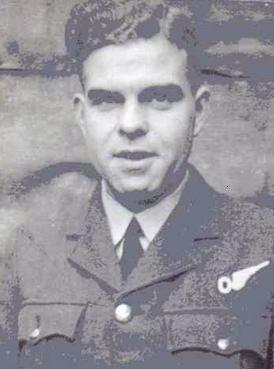 (Bob Edgeworth was killed in action during his second tour with 626 Squadron also based at Wickenby). 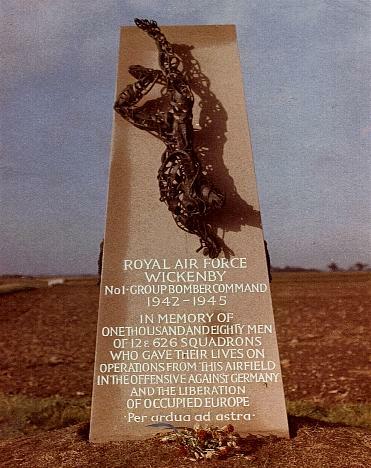 Photograph courtesy of the RAF Wickenby Memorial Collection. 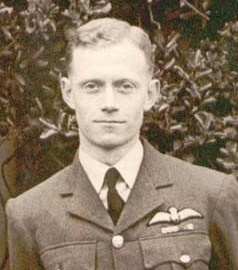 On 24/25th July 1943 P/O R.S Yell acted as second pilot on a raid to Hamburg. This raid was most notable for the fact that ED995’s outer starboard engine packed up just after bombing the target, but due to the skills of Jimmy Wright and some quick thinking by Wally they managed to get back to Wickenby without further incident. P/O Yell went on to take charge of his own crew and on the morning of 26th November after a raid on Berlin landed Lancaster JB354 PH-O on the runway only to veer off and damage the plane beyond repair! No injuries reported. 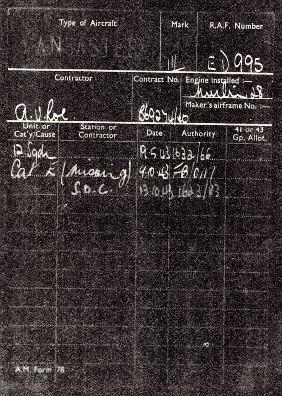 Unfortunately P/O Yell was to lose his life along with the rest of his crew on a raid on Brunswick on January 14th 1944.The Lancaster JB542 PH-M was lost to the combination of Flak and night-fighter, crashing at 19.11hrs. at Immensen, 6 km SE of Burgdorf. ED995’s next flight was to Hanover 3 days later. She never returned! The first tour consisted of 30 operations. however, Wally completed 31. 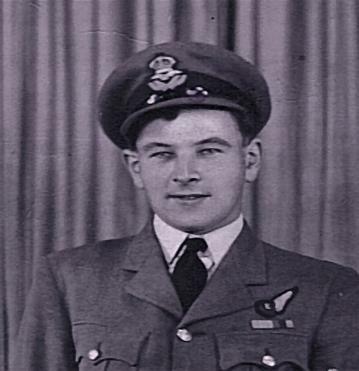 This was due to the fact that he was chosen to be the flight engineer to Wing Commander Craven on a night raid to Berlin on September 29th 1943. It was common practice for the Station Commanders to do occasional operations to keep their hand in. To do this they usually chose experienced crew members. This was Wally's 28th operation. For Wally the last few ops’ of his first tour were coming thick and fast. 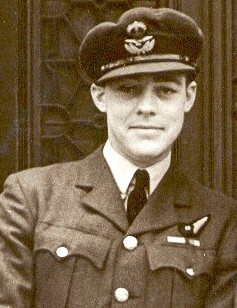 The very next day after his sortie with W Cdr Craven he was back with his normal crew on a raid to Hagen. This raid was completed in the early hours of 2nd September. Amazingly the crew flew on a raid lasting eight and a half hours to Munich that same night! So in reality that for Wally was the completion of his first tour he could walk away with his head held high having survived the 30 operations he volunteered for earlier that year. But such was the nature of this man he knew his crew and now close friends had only completed 29 ops’. So instead of walking away to a more normal life that morning he made the decision to do one more op’ so they could all finish their tour together. Frankfurt was the destination, October 4th 1943 the date, when messes Wright, Sanders, Hone, Tattersall, Heath and Shrimpton along with Wally set out on the last flight together. ED995's Trusty Rear Gunner George W Shrimpton. most of them in temperatures of minus 20 degrees! There seems to be a myth that the last op’ was always a ‘milk run’ something steady and not very dangerous. Well, a night raid over Frankfurt with a full bomb load at the height of the war is certainly no milk run. So what made Wally want to do this extra operation? He had done his Tour and survived horrendous odds and yet put himself back in the firing line! Many years later he explained why. "How could I have lived with myself had they not returned," he said. "The thought of that was far worse than the possibility of not returning myself." They landed back from Frankfurt in the early hours of October 5th 1943, for them all their first tour completed. For Wally to survive 31 operations with 12 squadron in 1943 is even more remarkable when during that year 66 crews had either been reported missing or had been involved in operational crashes whilst flying from Wickenby! Lancaster Bomber ED995 code PH-X, nicknamed Sarah, had stood the crew in good stead and as the tour progressed they became increasingly superstitious about anyone else flying in her. On the afternoon of 19th May 1943 at 15.40 hrs, they flew in her for the first time doing a 2 hour local flying stint. As the copy of the planes record at Wickenby shows it appears that they were the first to fly in her and little did the know that with both the great skills of the Flight Engineer and the craftsmanship of the manufacturers this plane would carry them for some 175 operational hours. The crew only failed to reach their target once during their tour. ED995 suffered engine failure just after take off on the night of 8th July but the ground crew got her airworthy for the next sortie to Gelsenkirchen the very next night. Three nights later with a full bomb load and only flying at 16,000 feet Sarah and the crew flew a 9hr 45 min op to Turin! Probably the most infamous raid that the crew was to be involved in was the attack on the V1 and V2 rocket base at Peenemunde on the Baltic coast. In the ever faithful PH-X at 21.20 hours on the evening of 17th August 1943 the crew took off from Wickenby and headed for Peenemunde carrying just short of a 5 ton bomb load (1 x 4000 lbs. 6 x 1000 lbs. and 2 x 500 lbs.) They successfully returned some 6 hours and 35 mins. later landing back at Wickenby at 3.55 in the morning. Of the 270 heavy bombers that attacked the target 40 never returned (almost 15%) A total of 270 aircrew lost their lives that night! On the completion of the first tour the crew went off for a well earned rest and just three days later ED 995 got a brand new crew for its next sortie. They must have felt really lucky to be in a plane that flew its previous crew through a whole tour, totally defying the odds. A copy of lost card above shows the names of the crew who were on their first and only flight on Lancaster ED995 that had served Wally and the rest of the crew so well. They must have considered them selves fortunate in taking over a lucky plane having served the previous crew so well, however lady luck was not with them that night. Pilot Sgt R A Collins Navigator Sgt W T Adamson Wireless Op. Sgt P M Adams Flight Engineer Sgt S B Watson M. U. Gunner Sgt E Mallin and Rear Gunner Flight Sgt J A O Strachan were tragically al killed when the plane went down in flames on the east bank of the River Wesser at Kreuzfeld Reese Street 31787 Hameln. Below is a report by Dr. Stefan Wellershaus who lived 300 meters from where ED995 crashed! He was just 11 years old at the time. I was born in 1932 and lived in Hameln during the war. From our house we often saw the red clouds above the bombed Hannover, reflections of the fire in Hannover. But very little bombing appeared in Hameln. But we saw the swarms of bombers passing over Hameln via Hannover and their fighting with the german fighters, including tracer bullets during night. On their way back they dropped empty fuel tanks and unused bombs that were spread over fields and forests. From 1933 to 1948 I lived in Hameln. Our house was about 300 m air line away from the Kreuzfeld (street) where one night a bomber crashed. It fell into a garden near a six-families-house, the body of the plane a few metres away from the long side of the house, one wing on the short side. May be the other wing was broken off and fell down somewhere else. The next morning my mother took me to that place, and from the first floor we watched the wreck including a few dead men under white cloths layed aside. It did not burn, there were no traces of smoke seen. The locations that I shall mention below are all on the WESTERN banks of the Weser river. The old centre of Hameln on the EASTERN. So the picture of the burning plane was surely not made in the Kreuzfeld and may not refer to the plane I just mentioned. Now more details on the wreck in Kreuzfeld: If you look at the google map you mention http://maps.google.de/maps?f=q&source=s_q&hl=de&geocode=&q=Hameln+Kreuzfeld , you see the house number 16 with a grey roof (wait a moment after opening the sattelite view). Opposite is a longer house with red roof. Behind the latter is a garden with now two trees on the lawn. The next morning I watched the body of the crashed plane from the southern side-wing of the house, first floor, close to the bigger of the two trees. The body of the plane layed where now the bigger grass area is, alongside the house, just where the two white spots are. The right wing stretched into the gap between this house and the neighbouring house with the grey roof. The bodies of the soldiers were layed down where now the bigger of the two trees are. I do not remember how many bodies there were, may be 4 or 5 or 6. The crashing of the plain did no damage to the houses or any people. It was as if somebody had layed it down with gentle hands. At least I can say that it fell down almost vertically in a horizontal position. The word, „Reese“ refers to a factory which at that time was located where now a green plain is near the word „Kreuzfeld“. My father was the director of the firm, but during the war he was as a soldier participating in the siege of Leningrad. The factory was later pulled down and a modern dwelling house built at its place which is not yet there on the sattelite picture. During that time I lived in the Leiststraße nearby in the longer white house with a red roof, near the word „Leiststraße“ (300 m distance to the wreck). Mr. Dr. Klaus Höpfner was an eyewitness the night when ED995 went down over Hameln. In October 1943 he was 18 years old and a Student of Medicine. Normally he had to study in Gottingen but at the time in September until November 43 he was in Hameln in the German Military Hospital. Maybe one or two hours later, Mr. Höpfner was called by phone from the hospital and told to his ride bike to the Hospital. Just when he reached it, he realised that sound of planes were in the air. After entering the Main Building many Persons of the Hospital went down from the stairwell to the basement and shouting “ The Plane fell of our House” … Mr. Höpfner was the only one who went further upstairs on the Top of the Main Building. He saw that a Bomber was on Fire and coming from the North ( Village of Holtensen) Two Engines were burning and the Bomber went down in a “spirally Flight”. He said that just for touching the ground ED995 explode in the Air. Next Morning he went to the crash Place of the Lancaster and it was closed by German Military Guards but due to his Uniform for Paramedics it was possible to get there. He remembers that one or two Crewmember was lying outside the Fuselage without heavy injuries. Than an Officer was coming and order that he had to recover all Personal Items of them. Later Mr. Höpfner found a Silk scarf with a Map from Europe on it. This Scarf is today in the Museum of Hameln. 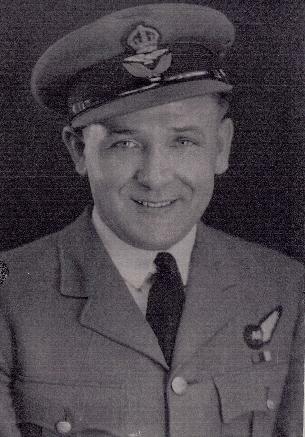 Bomb aimer Sgt P J Bemrose managed to bail out of the burning Lancaster before she crashed into the ground at Hameln just before 2am on the morning or 9th October 1943. 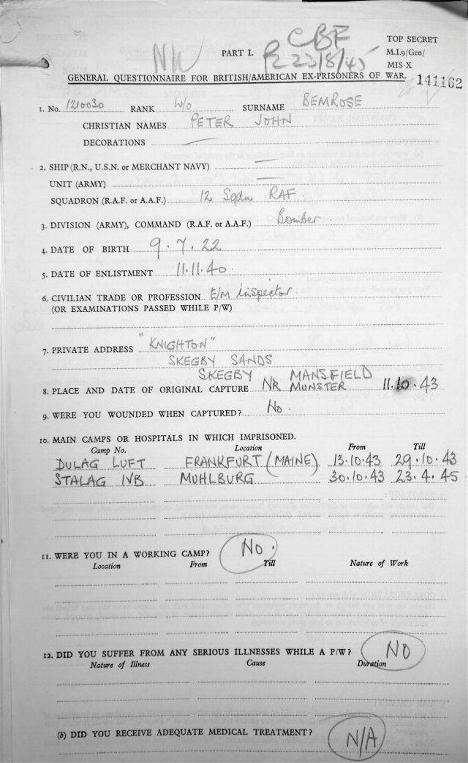 Sgt Bemrose was captured and eventually taken to a prisoner of war camp in Muhlberg, Stalag IVB. Muhlberg-on-Elbe is a small inland port some 80 miles south of Berlin. Stalag is an abbreviation of the German word Stammlager which means base camp. There were hundreds of them in Germany IVB was designed to hold about 15,000 prisoners but often held nearer 30,000 in the filthy cold wooden huts which were infested with all kinds of vermin. During his time here Sgt Bemrose contributed to an organization called the Muhlberg Motor Club run by Tom Swallow. One of several organizations founded in Stalag IVB to raise morale. The MMC produced magazines to keep fellow POW’s abreast of the motoring times. Using tea coffee and quinine tablets for ink and colour the magazine came complete with pictures. Sgt. Bemrose contributed to the magazine by writing poems and providing illustrations. 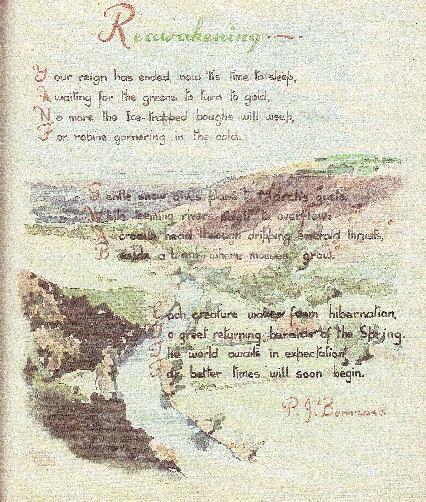 The poem Reawakening is shown below and is written over a painting of the Wye Valley. In 1945 when the fighting reached Muhlberg the camp was overrun by Cossacks of the First Ukrainian Army who, seeing the sentry boxes were empty, mounted a guard and held the prisoners for a further six weeks. Eventually they were all marched to Riesa where they were found by the Americans and from there were returned home. The picture above is the view of the Wye Valley with a poem by P J Bemrose written over it. This view kept Tom Swallow going through four years of captivity, when he first saw the original drawing, after the war - and after fifteen years of searching on every family holiday he could afford - he finally located the house with that view out of the top bedroom window and bought it to later retire to! All the other six members of the crew of ED995’s last operation who were killed in action are all buried at Hanover war cemetery Germany. 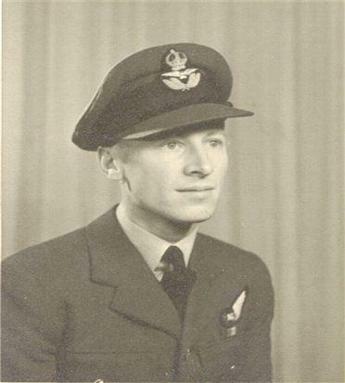 Whilst this web site is dedicated to my father I realise that if had not been for the courage of those who flew along side him I would not be here today to record his Bomber Command history. In the main they survived the war and I have had the great honour to meet and talk to many of them. However there are four brave young men who I never had chance to meet for they were all killed in action, their names are listed below. Son of Thomas and Elizabeth Routledge, of Pershore. Son of Harold and Dorothy Edgeworth, of Liverpool. Son of Harry and Ethel Adeane Young, of Woodford Green, Essex. Son of Frank and Margery Jean Yell, of Murga, New South Wales, Australia. These young brave men were just four of the one thousand and eighty men who died whilst serving with 12 & 626 squadrons at Wickenby between 1942 and 1945!